As the US Army pursues accelerated modernisation to meet the potential future demands of high-intensity warfighting against top adversaries like Russia and China, the service is searching for a new next-generation combat vehicle to replace the Bradley Infantry Fighting Vehicle produced by BAE Systems. The Next-Generation Combat Vehicle (NGCV) program is the second highest priority for the recently-established Army Futures Command. This brand new four-star command is dedicated to the research and development of future weapons systems for this new era of great power competition. The primary focus right now is replacing the Bradley with an Optionally Manned Fighting Vehicle (OMFV), although the requirements are still in the works, with Army officials noting that “all options are on the table.” The Army’s NGCV cross-functional team is looking for something lethal, survivable, and most importantly upgradeable so that it can continue to meet the Army’s needs for year’s to come, NGCV team leaders explained Tuesday at the 2018 Association of the United States Army conference in Washington, DC. The Army appears to be pursuing a vehicle that can be reconfigured for different missions, has an outstanding power-to-weight ratio for intensity-based and technological upgrades and modifications, and can wage war in both urban and rural environments to provide a deterrent force in Europe and beyond. The program is expected to issue an official request for proposals later this year, and companies will have around six months to prepare their offers. The NGCV program expects to field its new OMFV in 2026. 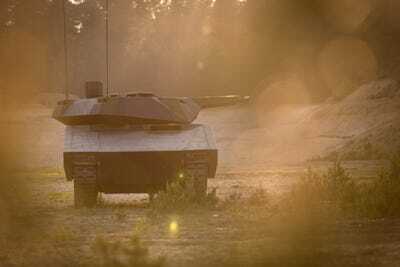 This Futures Command team is also looking at a new Armoured Multi-Purpose Vehicle (AMPV), Mobile Protected Firepower (MPF) option, Robotic Command Vehicle (RCV), and replacement for the M1 Abrams tank, but the expected delivery dates for these projects are farther out. 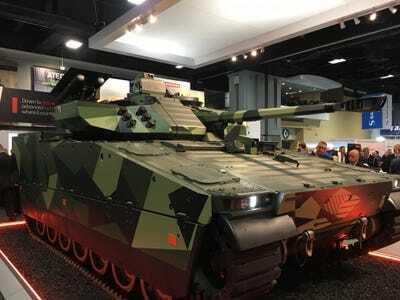 There are three full-scale OMFV concepts put foward by BAE Systems, Raytheon and Rheinmetall, and General Dynamics on display at AUSA 2018, although there may be more potential designs later on when the official request for proposals is sent out. While the three concepts on the floor offer many similar features, each vehicle brings something unique to the table. The strengths of this vehicle, according to its makers, include its growth potential and the mission-specific modularity and flexibility. In addition to this flexibility, there is also growth potential in the vehicle weight. The vehicle has a maximum weight of 40 tons. The floor model weighed around 30 tons, allowing for the addition of extra armour and weapons systems should the intended mission require these modifications. The vehicle’s 35 mm cannon can be easily modified should the Army show an interest in a 50 mm main gun, something Col. Jim Schirmer, the project lead for the NGVC, told reporters Tuesday that the Army is seriously considering. The BAE Systems vehicle also features a drive-by-wire system for manned and unmanned missions, advanced data transfer capabilities, enhanced survivability as it sits low to the ground (hard to see, hard to hit), advanced 360 surveillance, smart targeting systems, airburst munitions for counter-drone warfare, and active protection systems that can be modified as the Army presents a clearer picture of what it expects. 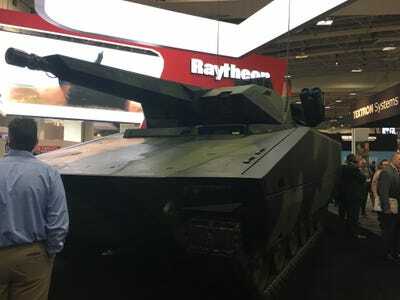 Raytheon and Rheinmetall joined forces to create the Lynx KF41 Infantry Fighting Vehicle, presenting it at AUSA 2018 as a ready-right-now OMFV option. Described as a “not business as usual” project, the Lynx KF 41 Infantry Fighting Vehicle is the byproduct of a partnership between Rheinmetall, which has an extensive knowledge of vehicles, and Raytheon, a company that excels at integrated electronic systems. The Raytheon team emphasised modularity for mission-specific modifications in a brief discussion with BI on the floor at AUSA 2018. “The whole thing is very innovative. 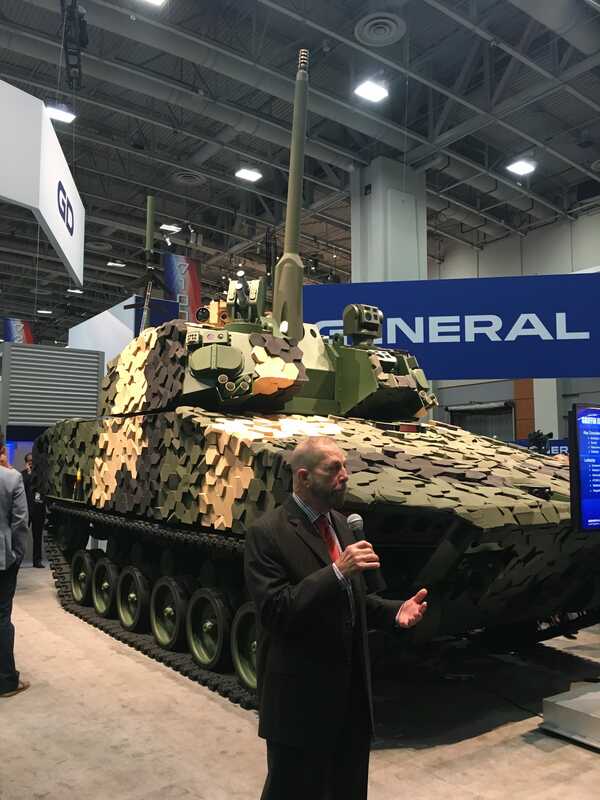 You can take this configuration, remove the top, make it into another configuration, and you can do that overnight,” Kim Ernzen, vice president of Land Warfare Systems at Raytheon, explained. She revealed to BI that during recent trials, crews were able to change the configuration in roughly three hours. The survivability of the vehicle can be changed in accordance with the demands of the fighting environment. With roughly 20 tons of configurable payload, the chassis can support additions up to 55 tons for high-intensity combat against an adversary like the Russians. And the main gun can be modified from a 35 mm cannon to a 50 mm gun as needed. The Lynx IFV supports up to nine dismounts with a three-man crew, as well as as next-generation thermal sights, Coyote unmanned aircraft, active protection systems to counter a variety of asymmetric threats, a fully-integrated situational awareness sensor suite, and an extended-range TOW missile system, among other features. 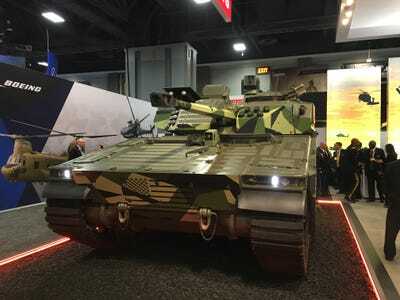 The spokespeople for this OMFV project repeatedly stressed that the Lynx would be manufactured in the US, supporting the US industrial base and creating jobs. But perhaps more importantly, the vehicle is a finished product, not a concept, that could be ready to go on a moment’s notice. 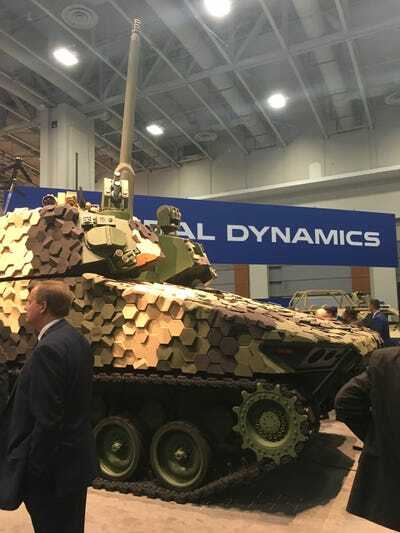 Produced by the company the makes the M1 Abrams tank, also slated for replacement, General Dynamics’ Griffin III features lethality, modularity, and growth options, among other capabilities. In terms of lethality, the modular turret features a 50 mm main gun with the option to modify the weapon to a 30 mm cannon if necessary and the ability to fire at an 85 degree angle, a capability requested by the Army for urban combat. The 50 mm gun is significantly more powerful than the Bradley’s current 25 mm cannon. Supporting a squad with five to eight people and a two-to-three-man crew, the newest evolution of the Griffin I and II is, according to General Dynamics, focused on “adaptability” through the company’s emphasis on a modifiable, open architecture. 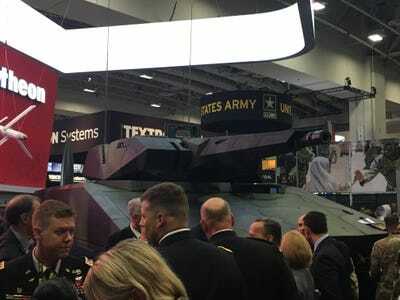 At the same time, the vehicle features a wide variety of integrated systems with a common operating system, specifically active protection systems, laser warning systems, 360-degree surround view, and a deepstrike package, Mike Peck, the director of enterprise business development at General Dynamics told BI at AUSA 2018. “All of that is integrated in there. You don’t have to keep adding boxes to the vehicle,” he explained. The Griffin is said to have a lot of “unique” features designed to trigger additional conversations with the Army going forward. The Griffin III is meant to satisfy the Army’s vague requirements for the OMFV as they are right now, but it could be changed.